Osiris, supreme god of resurrection, was closely associated with the life-giving forces of nature, particularly the Nile and vegetation. Above all, he was connected with germinating grain. The emergence of a living, growing, plant from the apparently dormant seed hidden within the earth was regarded by the Egyptians as a metaphor for the rebirth of a human being from the lifeless husk of the corpse. The concept was translated into physical form by the fashioning of images of Osiris out of earth and grain. These "corn-mummies" were composed of sand or mud, mixed with grains of barley. 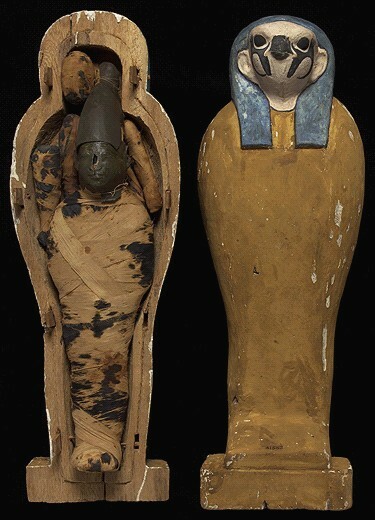 As in this instance, the "mummy" is sometimes wrapped in linen bandages and may possess a finely detailed mask of wax, representing the face of Osiris.